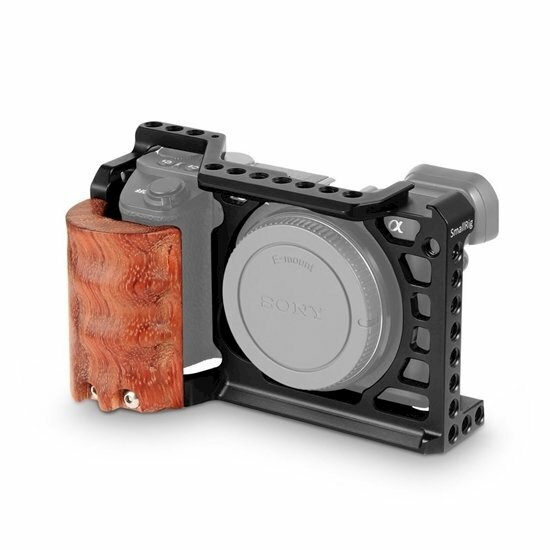 The cage is exclusively designed for Sony A6500 and blocks no access to the ports, bottoms and controls of camera. The cage comes with an abundance of 1/4’’-20 threaded holes for DIY operations. The handgrip is ergonomically designed thus feels very comfortable. The cage comes with Arca Swiss QR plate at the bottom to drop in to Arca Baseplate 1934 directly, and it features quick release and attachment. Cold shoe on the cage could be mounted with flashlight, microphone or LED light. The cage is equipped with an Arri locating point for Magic Arm 2026 and then monitor. Meanwhile, NATO rail on the side of cage could be mounted with NATO Clamp to Arri Rosette 2046 and then Right Side Wooden Grip with Arri Rosette 1941 for a very comfortable gripping experience during shooting.